The Hariyo Ban Program’s three cross-cutting themes will ensure that the program focuses on poor and marginalized groups including women, Dalits, and Janajatis. The cross-cutting themes will contribute to addressing two prominent agendas of Nepal-in-transition: poverty alleviation and social justice. Approximately half of Nepal’s population of 28 million people is female (Central Bureau of Statistics Nepal, 2010). A strongly patriarchal culture adversely affects women’s position in society. 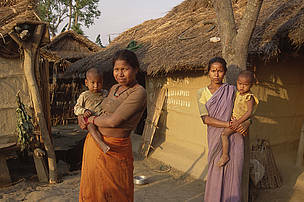 Yet many rural women need forest resources for the wellbeing and livelihoods of their families. In addition, Nepal's poorest and most disadvantaged people depend heavily on forest resources or rain-fed agriculture for their livelihoods. Inequitable distribution of rights, resources and power, and repressive cultural rules and norms constrain women, poor, Dalit, marginalized Janajatis and youth from fully engaging in and benefitting from natural resource management and climate adaptation. In light of this, the Hariyo Ban Program has gender and social inclusion (GESI) as a key cross-cutting programmatic approach, helping empower both women and men to challenge and change deeply rooted inequalities and improve the policy environment. Systematic efforts will enhance the capacity of women and socially excluded groups in taking leadership to claim their rights to productive resources and services. This will help ensure their meaningful participation as power agents in sustaining conservation and climate change adaptation together with strengthening equitable benefit sharing mechanisms. The Hariyo Ban Program’s livelihoods approach is an essential and intrinsic cross-cutting element in all three thematic components (biodiversity conservation, climate change mitigation/payments for ecosystem services and climate adaptation). The economic empowerment of poor and excluded people is vital to increase their power and participation in local governance institutions. It also increases their resilience to climate variability and climate change by building their capital and capacity to better withstand shocks. Hariyo Ban’s interventions in gender and social inclusion issues and improved governance of natural resource management groups will create a conducive environment for livelihood improvement activities. The Hariyo Ban program will follow the Livelihood Improvement Planning (LIP) approach to promote forest-based small enterprises and allocation of community forest land to poor and marginalized people for non-timber forest product (NTFP) cultivation. In addition, ecotourism, piloting of an innovative payment scheme for wildlife presence in community-managed forests, and activities that build climate resilience such as community seed banks, rain-water harvesting and drip irrigation will also be supported to increase food security and reduce disaster risk. Where appropriate, the Hariyo Ban Program will work closely with the private sector, promoting sustainable activities in the two landscapes that contribute to the local economy and livelihood development. Strengthening internal governance of Natural Resource Management (NRM) groups and their networks is critically important, to enhance their role as custodians of natural resources and ensure equitable benefit sharing amongst the group members, particularly the most marginalized. The practice of good governance is also important in making the accountability of government line agencies (public authorities) more effective. Hariyo Ban sees the process of improving governance of both NRM groups and government line agencies as a state-citizen interface that promotes democratic practices. Participatory Governance Assessment (PGA), Community Learning and Action Centers (CLACs), Participatory Well Being Ranking (PWBR), and Public Hearing and Public Auditing (PHPA) are a few of the planned activities the Hariyo Ban Program will undertake to strengthen governance of NRM groups and government line agencies. It will also support NRM groups to enhance their organizational capacity by providing training on group management and leadership, financial management and record keeping, and gender and social inclusion. It will facilitate coordination and interaction with district-level government line agencies.